Hermann Göring began his military career as a WWI flying ace and ended his days as a convicted war criminal at the Nuremberg Tribunal. “There is nothing to be said in mitigation. For Göring was often, indeed almost always, the moving force, second only to his Leader. He was the leading war aggressor, both as political and as military leader; he was the director of the slave labor program and the creator of the oppressive program against the Jews and other races, at home and abroad. All these crimes he frankly admitted. On some specific cases there may be conflict in testimony, but in terms of the broad outline his own admissions are more than sufficiently wide to be conclusive of his guilt. His guilt is unique in its enormity. 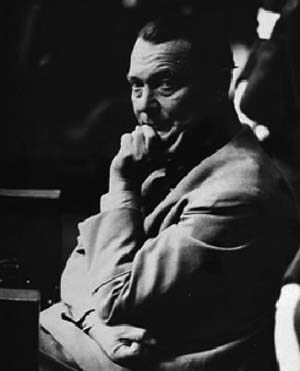 Thus, Hermann Wilhelm Göring was pronounced guilty on all four counts of the indictment and sentenced to hang. On the evening of October 15, 1946, he was secretly scheduled to be hanged. However, he took a cyanide capsule he had evidently managed to keep hidden. It killed him in five minutes. He received the last rites of his Lutheran faith and died at 10:50 pm. The indictment failed to mention that Göring was both a German field marshal and the ranking officer of all the armed forces of World War II as the reich marshal appointed by Adolf Hitler, his Führer, a sort of six-star general—a title that still stands, by the way. It also failed to mention that he was a morphine addict for many years of his adult life, and had once been put into a straight jacket and committed by his first wife to an asylum for the insane in Sweden. 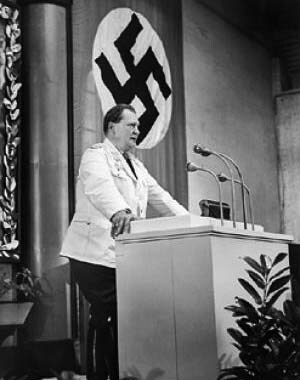 Just a few short years later, Hermann Göring was one of the mightiest men on Earth, and also one of the richest. He created one of the globe’s greatest air forces, yet did all he could to prevent the outbreak of World War II. Truly his life and career are like no other in modern times. The photographs shown here come from his 47 personal photo albums in the Library of Congress in Washington, DC, as well as other public and private sources discovered since. This is Hermann Göring as he saw himself. Tags Adolf Hitler, Hermann Göring, Nazi Party, Nuremberg Tribunal.